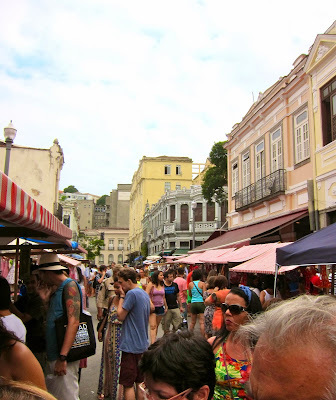 On Saturday my friend Shanna invited me to this street market in Lapa that only happens the first of the month. We headed off on a crazy bus journey in hopes of finding some cool wall art and new summer clothes, but what we discovered was the best block party ever. Lapa is a funky neighborhood in Centro where old meets new. 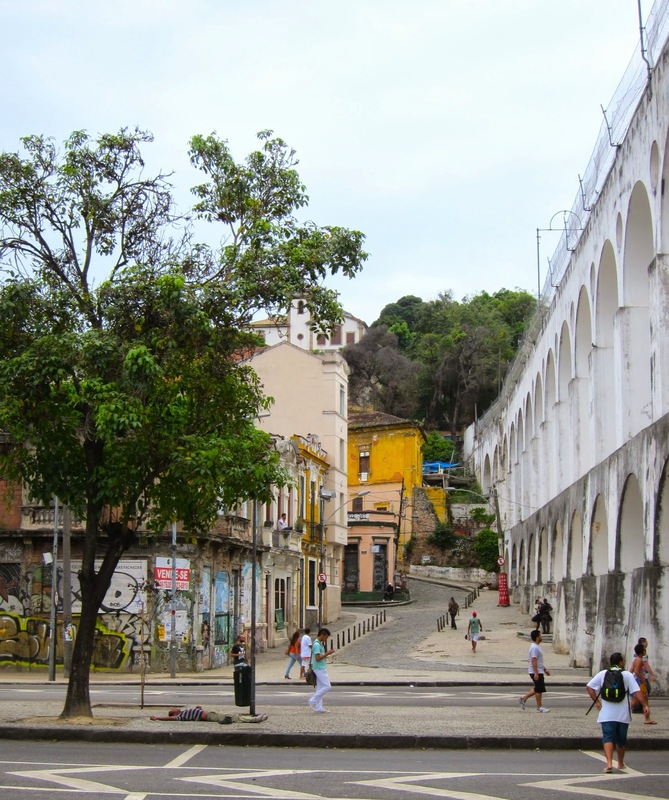 The neighborhood starts with the Arcos da Lapa, an abandon 18th century Roman aqueduct. An old trolley called the bodinho use to run right along the top until people starting falling out. Hub's been on it before and said it was scary as hell. Past the arches the streets are lined with samba clubs, boutiques and botequims - traditional Brazilian bars where you can get a choppe (draft beer), pastels (savory fried pastries) and other typical fare. Everything is housed in these colorful rundown colonial buildings and it's what I've imagined Havana to be like. Although I've never been there, our friend Karin said Lapa reminded her of Cuba. We stopped for lunch at LapaMaki, a great little sushi spot on Rua do Riachuelo. The food was fresh and my yakisoba with legumes was delish. 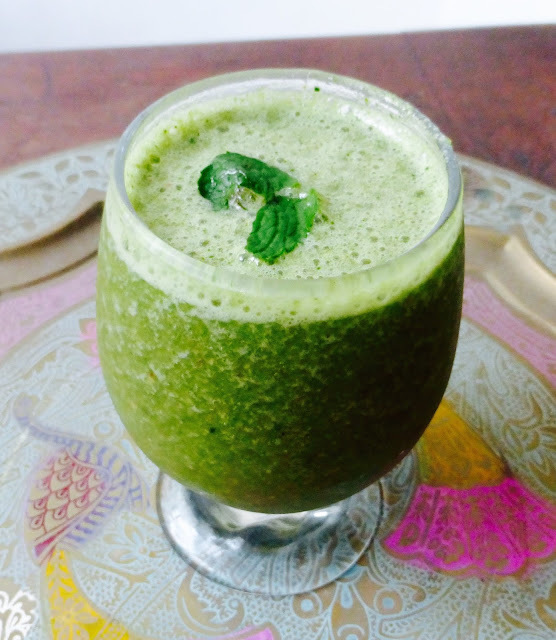 It felt good to eat something healthy and that contained non-fried colorful veggies. 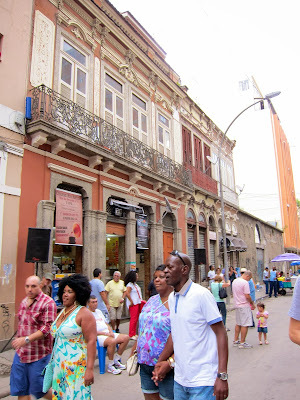 As we check out the stalls and cool furniture shops off Avenida Mem da Sa, we walked into Rua do Rezende where food and beer vendors set up shop and a DJ was spinning American disco classics. We bumped into our friend Charlie who was there to film the party hosted by Charme Rio Antigo and web radio Clube Black Music. Yep they call it blackee musiquekee. He encouraged us to stick around and witness the spectacular event that would soon unfold. Disco line dancing. They had about 5 or 6 different dances and the guys leading made it look so effortless and cool. You couldn't help but study the footsteps so that you could join in like these ladies. It was infectious! And it just kept growing until this. A full blown out party and it was the happiest thing I'd ever seen. I mean don't you just want to chime in "RIO, RIO." It's been a tough adjustment to this Carioca life, but discovering hidden gems like this make me realize that I'm just beginning to scratch the surface of my new life.